This new high clearance design is a true blend of performance, appearance, and function. The suspension geometry creates an OE style ride with a desert racing appearance. These high arched crossmembers blend perfectly with the lower control arm angles to give a truly OE appearance while lifting your vehicle a full 4.5” and increasing ground clearance at the front crossmember by 91%. 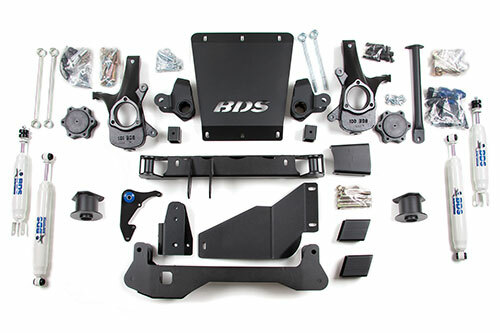 A heavy duty front skid plate and differential skid plate is included for extreme off road protection. The rear lift is accomplished with coil spring spacers, track bar relocation, sway bar links and extended bump stops. Larger tires cannot be installed on OEM wheels. If equipped with stock 17" wheels, then you must install 17" or larger aftermarket wheels. All wheel drive models will require drive line modification.